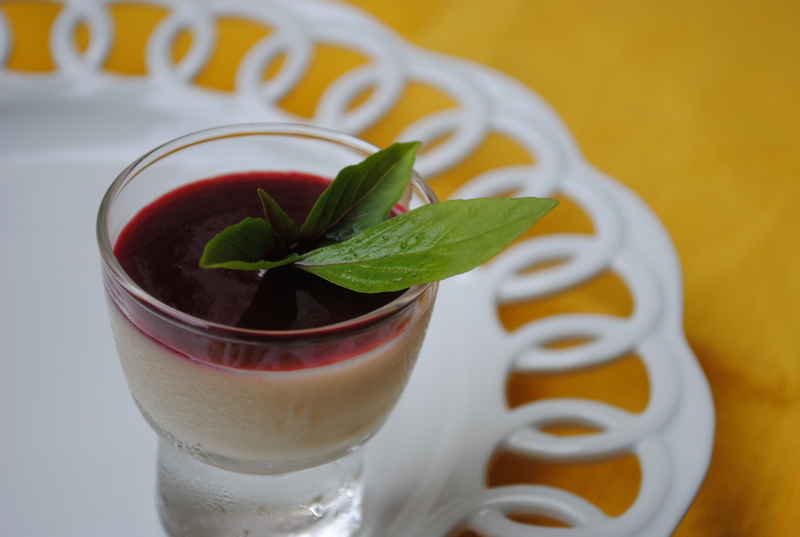 Panna Cotta has been a dessert that has captured my imagination for a while now. All those lovely creations accross the blogosphere have not helped either. The very thought of spooning “cooked cream” into my mouth sometimes had me salivating. But you really have to wait for good things to happen sometimes. And I had to make this for myself. I chose low fat cream. Yes I am a wuss that way, but you can go ahead and use full fat if you are feeling indulgent. I bought a bag of frozen raspberries. I had all these beautiful raspberry filled dreams, till i cut open the bag and found that they had become large lumps of frozen squashed raspberries! Lumps of frozen raspberries are better than no raspberries and so I used them to make a sauce to be poured over the Panna Cotta. You can use any berries of choice, I think strawberries will work great here. as will any fruit preserve. Just thin it down with a little water and heat. In a saucepan, add the cream, milk and chopped chocolate. heat gently on a low flame and bring it to a gentle boil, stirring continuously to help the chopped pieces of chocolate melt. this will take about 3-4 minutes. Add the powdered agar agar to the heated mixture and stir till it has melted into the cream mixture and is thoroughly combined. Take the saucepan off the heat and allow it to cool for about 10 minutes. the mixture will begin to start getting thicker, mix it a couple of times to prevent a skin from forming. pour this into small shot glasses or small bowls. cool completely and cover each one with clingfilm. chill it in the fridge for a minimum of 4-5 hours or overnight. This stays in the fridge for a few days, so is a good make ahead dessert. In a saucepan, add 2 cups of raspberries (I used frozen), 3-4 tablespoons of sugar and 1/3 cup of cold water. Heat it on low heat for about 10 minutes, stirring now and then to make sure the raspberries are cooking through. the colour will begin to darken and the mixture will vigorously bubble over, take it off the heat and mash thoroughly with the back of a ladle to smash everything together. Cool this mixture for about 15 minutes and then pass it through a soup strainer to remove the seeds. These quantities will make you about 2/3 cup of raspberry sauce. Chill till needed. 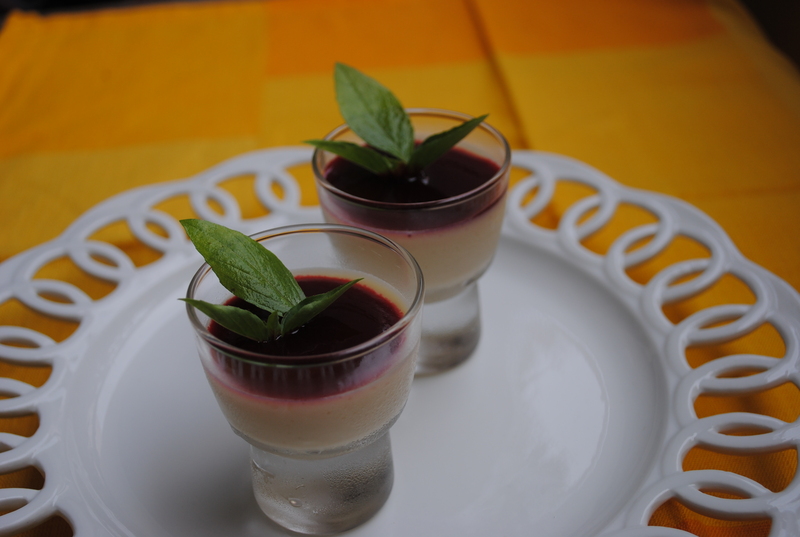 To serve the pannacotta, spoon a few teaspoons of the raspberry sauce over the set pannacotta, garnish with mint or basil leaves and serve. If you do not have berries of anykind, use 1/4 cup of fruit preserve or jam of choice. Add 1/4 cup of water and heat gently, stirring it to get a thick sauce. Hi Shamma, this recipe needs the cream to be cooked. I have never used hydrogenated cream, which I am assuming is a non dairy cream. I am not sure how hydrogenated cream will react to heat. You could try using full fat milk boiled till it is thick. Depending on where you live, use half and half if you can find it. Do let me know how it turned out with the alternatives, would like to update the post with the results. Thanks for this recipe! How much vanilla extract should I use if I’m not able to find vanilla-flavoured agar agar? @Sailu: Agar Agar is aviable in some supermarkets and in many alternative stores. Oh My GOODNESS!!! Cooked cream with raspberry sauce!! Ooooo. Beautiful! Thanks for the headsup, Arundati. And that was really quick! Do you still take chocolate classes ? I used to take them in Chennai a year back..I also quit work and found solace in chocolates and writing .. I have always wanted to try making pannacotta at home… and this recipe sounds super-simple and delicious! now to just figure out where i can get hold of agar-agar….! Where in Hyd did you pick Agar Agar, Aru? And frozen raspberries? I have a friend coming down from Hyd. I can ask her to bring them for me. Bookmarking to try. I rather use raspberries instead of jam.